Silk Flowers Versus Fresh - A Better Choice. Why? Before you answer, I ask you: Have you checked out the silk flowers, foliage and artificial plants and trees that are available these days? It's hard to believe how realistic they look, and feel. Take a good look at the artificial Lily image to the left, which I personally photographed. The latex-finished blossom measures about 5 inches across, and stem length is at least 28 inches. Incredible detail, don't you agree? Even the television and movie industries enjoy the benefits of using 'permanent botanicals' (a fancy way of saying artificial flowers) for set decoration. After all, replacing real floral displays when they start wilting after a day under hot lights is expensive! 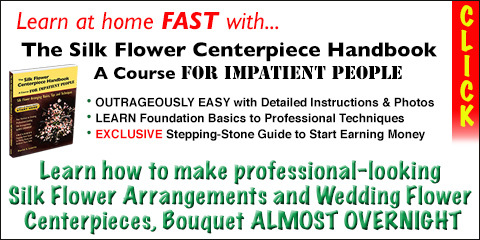 If you're a flower arranging hobbyist, you'll find it more fun than ever to create fantastic designs that can easily fool the eye as close as an arms length away. So, on to the comparison...I am just going to list the advantages of using silks in floral designs. You can assume the opposite applies to fresh flowers. Artificial flowers last...and last...and last. And they can be cleaned easily and quickly to look fresh as ever. Weather conditions will not affect them. They don't need care or feeding, won't wilt, dry out, or die. If you're a slowpoke silk flower arranging hobbyist like me, it's nice to come back to a floral design project after a vacation or long weekend away, and pick up where you left off. Silk and artificial elements can be RE-USED again if in good condition. Don't throw them away — recombine them and build a brand new flower arrangement! Silk bridal bouquets are much lighter to hold than fresh. I'm sure you will appreciate that a silk flower wedding bouquet will seem almost weightless, compared to a fresh bouquet that requires water-soaked foam to delay wilting. For destination weddings, a silk bridal bouquet can be packed in a suitcase and emerge unharmed hours or days later. And there won't be any problems with international Customs authorities. I hope this article has got you thinking about the possibilities and advantages of choosing silk flowers. Can you come up with more ideas?